Government spying with Window Cleaning Platforms. Niko Bellic operating a window cleaning platform during the mission Blood Brothers in Grand Theft Auto IV. A window cleaning platform is a platform that can ascend and descend the faces of skyscrapers and other large buildings to clean windows. It has by large been a non-interactive prop wherever it is featured in the Grand Theft Auto series, with Grand Theft Auto IV being the only game where players have access to usable window cleaning platforms. In Grand Theft Auto IV, window cleaning platforms are operable items featured on several buildings in Liberty City, being available for use at any point of the game; the player can control the movement (up or down) of the platform to ascend to the top of buildings, or descend from a building if they land on its rooftop using a helicopter. 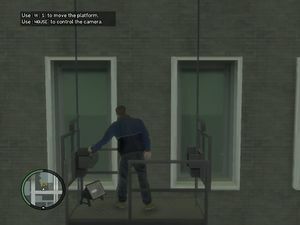 Window cleaning platforms are also used in three missions in GTA IV ("Blood Brothers", "Deconstruction for Beginners", and "Late Checkout") during which they are used to ascend buildings to gain a good sniping position or advantageous assault/escape. A non-operable wooden window cleaning platform is also present on the San Fierro Tower in GTA San Andreas. There are only a total of 11 window cleaning platforms in GTA IV, all of which are concentrated within midtown and downtown Algonquin and Alderney City. As a hint to players, Whattheydonotwantyoutoknow.com includes an image attachment on forum post showing the location of all the platforms thought the city. Southern corner of the Mammon Heights tower in Middle Park West, Algonquin. Southeastern corner of Cleethorpes Tower in Hatton Gardens, Algonquin. Northern side of a lowrise at Lorimar Street (between Albany Avenue and Bismarck Avenue) in Hatton Hardens, Algonquin. The player must climb up a scaffolding to reach it. Northern side of an apartment at Albany Avenue (directly south of Algonquin's skycar station) in Lancet, Algonquin. Western side (rear) of an office skyscraper at Albany Avenue (between Hermatite Street and Jade Street) in Easton, Algonquin. Western side (rear) of Hotel Uberbrucker in Star Junction, Algonquin. Western side (rear) of the MeTV studios in The Triangle, Algonquin. Eastern side (rear) of a skyscraper at Borlock Road (between Barium Street and Calcium Street) in Fishmarket South, Algonquin. Western side (rear) of a skyscraper at South Parkway and Bismarck Avenue in The Exchange, Algonquin. Western side of a lowrise at Lyndon Avenue and Bowline in Alderney City, Alderney. Northern side of a skyscraper at Asahara Road and Boyden Avenue in Alderney City, Alderney. This page was last modified on 8 January 2012, at 19:21.